Naked boys jumping into the river or two coolies perched on their stools and slurping down a meal of rice porridge … these are two sculptures that many of us are familiar with in our Singapore environment. But just recently, sculptor Chong Fahcheong who created these sculptures held a solo exhibition that revealed a totally different side of his artistic world. The exhibition, “Passages”, held at Emily Hill, had more than 20 sculptures that were well received by a wide audience of art lovers. 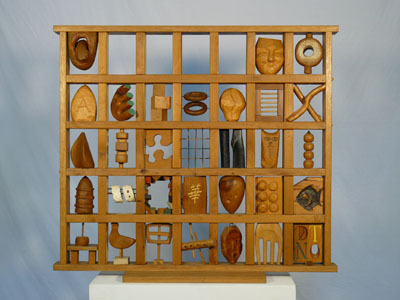 There were many new, big works made of many materials – wood and stone of different types, jade and bronze – as well as older works from the artist’s personal collection. 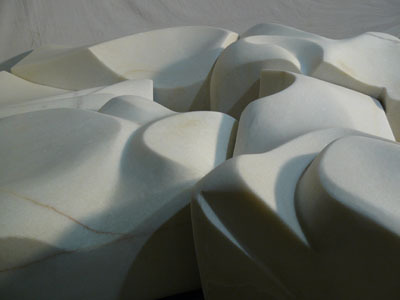 The selection of pieces showcased Fahcheong’s skill and passion for working in many different carving mediums. Fahcheong finds inspiration for many of his works as he loves to “people watch” everywhere he goes and is especially fascinated by the sights and sounds of Singapore. Travelling on the MRT Train from home to his studio, or while having a plate of char kway teow and drinking kopi siew tai, his attention is claimed not so much by the food as by the animated group of ah mahs at the next table with their garrulous chatter accompanied by the broad and generous gestures of flying hands and pointing fingers. “I’ve got to capture that in a sculpture,” he says, to his breakfast companion in the kopitiam. 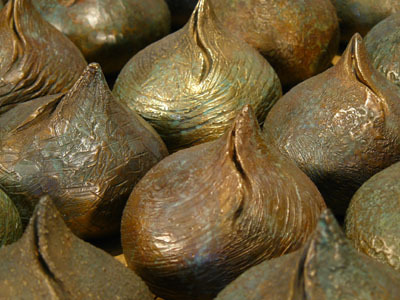 Fahcheong’s sculptures have certainly captured the flavour of Singapore past. Born in 1946, he is a child of the post-war years and some of his public works reflect this time frame. First Generation, that bronze sculpture of five naked boys jumping into the Singapore River, is very well known. “I remember seeing boys jumping into the river when I was young. 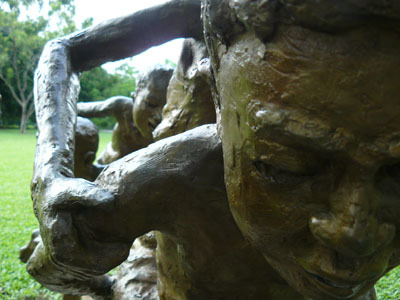 A recently completed sculpture is that of six boys at a game of piggy-back. Chang Kuda can be seen in the Singapore Botanic Gardens, opposite the Swan Lake. “In those days, we were not buried under a mountain of schoolwork and homework. We would throw down our books the moment we came home from school and run out to play. We never returned home until it was dark,” says Fahcheong. Although sculptures like these take us back to a time before, Singaporeans today can still relate to the ideas of fun and simple childhood play that they depict so well. That is why the sculptor Chong Fahcheong is important in the Singapore art scene. He helps us to remember our past, placing us in the context of our history. It is only by knowing our past can we move forward with confidence into the future. Although he lives in Canada, he spends much of his time in Singapore, returning again and again to his roots. He says his connection with and exploration of his cultural roots was never so strong until he moved away from the island of his birth more than 20 years ago. For images of all new works in Passages Exhibition click HERE.